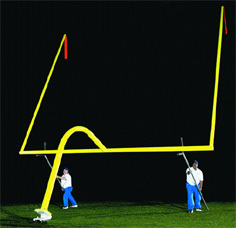 The HINGED GOAL POST can be lowered to the ground within seconds after a game to discourage fans from rushing the field and trying to pull down the goal posts. The added benefit of the hinge system is the time savings involved in installation and disassembly. The hinge is located at grade level. This optimizes safety and permits leveling of the entire post from the ground up. 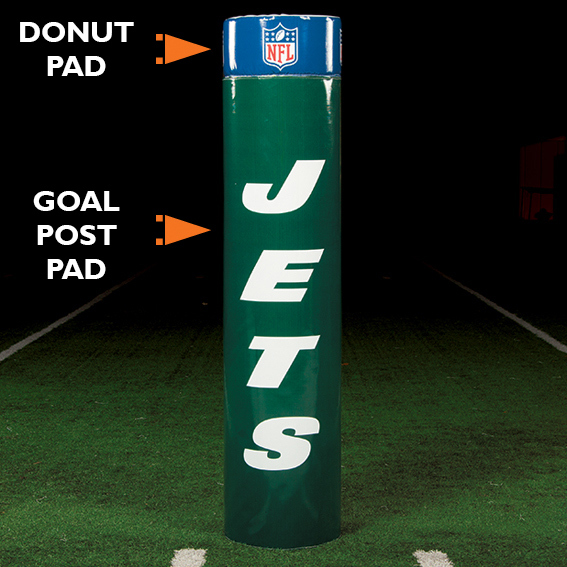 A standard Goal Post Pad fits over and protects the hinge. The hinge is designed for strength and safety. It features a continuous and reinforced hinge with a rugged 1-1/2" diameter shaft pin. Dropping the Goal Post involves unscrewing the two heavy-duty "T" handle bolts and then using Yoke Poles to lower the crossbar to the ground. Four ground personnel can accomplish the task in 30 seconds. When the Goal Post is on the ground, the uprights can be quickly removed. The hinge is designed for aluminum goals only. 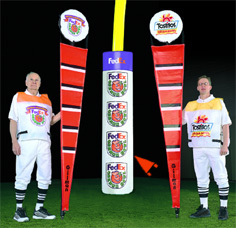 The package includes four yokes, two hinge mechanisms, two ground sleeves and a complete set of aluminum goal posts. Existing goal posts can be retrofitted with the hinge mechanism. Call for details. Price unpainted. Powder coating optional. Sold as a pair. The EYELET TAB consists of a welded bracket that allows cable hook-up. Using a mechanical winch, the Hinged Goal Post can be raised or lowered to the ground with greater efficiency. The Adjustable Crossbar is designed for the stadium that hosts both high school and college games. Telescopes from a college width (18'6") to a high school width (23'4"). The Access Kit is a box frame set at the base of the gooseneck to create a void above the anchor plate. Includes two drop-in plugs for the box.